In our last newsletter I wrote about the adventure and magic that we enjoy as winemakers. I also briefly described it as a privilege. I used that word because it implies a sense of honor—an opportunity so good that it demands excellence—but also a sense of luck—appreciating the opportunity and feeling gratitude for having it. Now, between Thanksgiving and the New Year and after the rush of harvest and the devastating wildfires that ripped across our community 60 days ago, I appreciate the privilege to make wine in Sonoma County more than ever. We were lucky. Everyone we know is safe. None of our family or employees or my closest friends lost their homes. We sustained no damage to the tasting room or winery. My wife and I hosted families and pets who evacuated to our house in Petaluma and eventually all returned to their homes. But from the morning after the fires started and for the next 10 days at least, every conversation started with “Are you okay? Is your family safe? Did everyone in your circle come out okay?” Far too many people I know were not as lucky as we were. Many of my friends or their parents lost their homes. One friend woke to fire so close that she didn’t even grab her wedding ring off of her nightstand—she and her husband grabbed their kids and dog and ran out the door. Luckily they were safe. Many of our customers were affected. One Tribe member reached out to us, sharing that he lost his house and his cellar including Meeker wines going back to the 1995 vintage (we were grateful to help him replace some of his favorites). The fires left behind many more stories like these. For many folks here in wine country, things will never be the same. But as I drive through the burn scar in my daily commute, now that we’ve had a few rains, the hills are slowly turning from black and brown to green as new grass grows through the char. It’s hard to talk about something positive in the context of such tragedy, but the immediate outpouring of support and care and love—both locally and from afar—left me awestruck, impressed, and proud. We continue to do our best to contribute to the recovery effort, and we thank and appreciate those of you that have helped as well. More help will be needed, and if you’d like advice on where to direct your contributions, Kelly wrote a blog post on our website that details the best ways to donate. On to a lighter subject: I’m happy to report that regardless of the fires, this year’s wines look to be off to a strong start. It’s always hard to summarize the characteristics of a vintage when we make so many different wines, but on balance our 2017 wines benefited from longer hang time to the tune of 10-15 days and substantially more consistent ripeness across vineyard blocks. Yields were either about average or down 10-30%, depending on the vineyard. Quality overall was above average, with some stellar picks mixed in, particularly from Dry Creek. 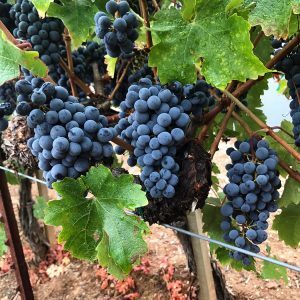 There were some interesting quirks to the vintage as well (and as always): We had a few instances of weather that led to extended pauses in ripening—one brief rain and cool phase saw some vineyards drop 1-2 degrees Brix. In most years over the past decade we’re usually dealing with fruit that has plenty of sugar but lacking phenolic ripeness and physical berry maturity. This year, especially with Cab and Merlot, we found ourselves happy with phenolic ripeness and acidity on a couple occasions but waiting on sugar. A nice change of pace, to be honest, because ripening patterns like this play to the favor of our winemaking style. Turning to this shipment, we’re sending you a nice pairing of something old and something new. The “old” would be the library vintage of Four Kings. Normally this shipment would feature a 2014 Four Kings blend. Unfortunately, we didn’t have the wines (all four “Kings”) from the 2014 vintage to assemble a Four Kings blend from this vintage. Instead of skipping Four Kings in your shipment (which we feared might lead to a small Tribal uprising), we are sending you one from the library. We want to be sure to let you know that we sent this at the normal Four Kings retail price (before your discount), as opposed to the Library price. As you’ve probably heard before, one of our main winemaking goals is to build wines that age well and continue to evolve for 10-20 years. We also know that the majority of wine drinkers don’t wait that long (you’re thirsty, I get it). So, when we have an opportunity to send you a wine from the library, especially a perennial favorite like Four Kings, we take it: it lets us show off how beautifully our wines age. The something “new” in this shipment is the new packaging on the 2015 Grenache. This is the same Grenache release you’ve gotten used to in your November shipment, but the first time you’ve seen the updated version of what we refer to as the “M-Bar” packaging. The M-Bar package concept hadn’t been updated since I first designed it in 2009 (or somewhere around there), and it had fallen out of line with the packaging on our other wines. After a few attempts over the past year, we finally came to a consensus on this new look. It blends elements of the old M-Bar concept and colors with the spartan spacing and lettering of our more recent labels (the Cab Franc, Paddle, Pinot Noir, DCV Cab Sauv label group which we call the “New-Old” labels (admittedly, our in-house naming of these things could use some polish)). I’m happy with it, but I’d love to hear feedback from all of you as well. As we move into the holiday season and prepare for the new year (and our 41st year in the Sonoma County wine business), I’d like to thank you for continuing to support our family business and the employees, growers, vendors, and community that make it possible. We are fortunate and grateful to be part of the ongoing adventure of making wine and we are blessed to have you along for the ride. From all of us—Molly, Charlie, Kelly, Ricardo, Jeff, Janelle, Kat, our families, and me—we wish you and yours a bright and merry holiday season as well as our highest hopes for a happy, healthy, and prosperous 2018.